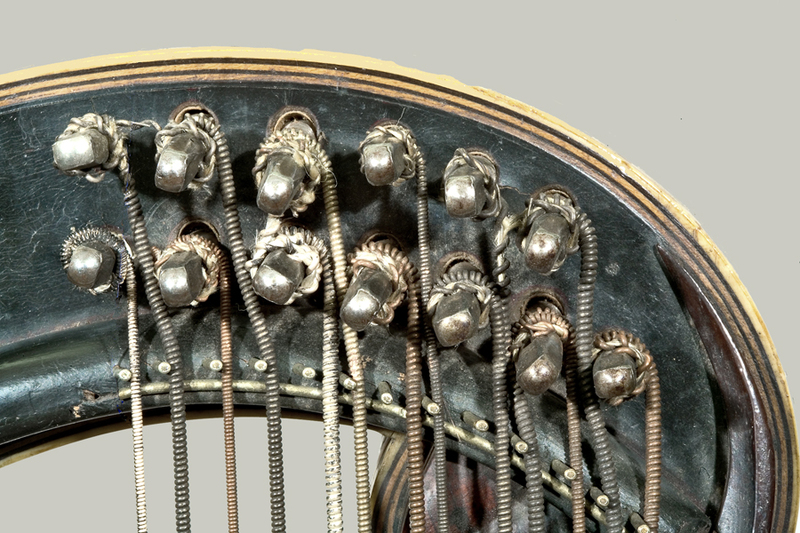 NMM 12970. 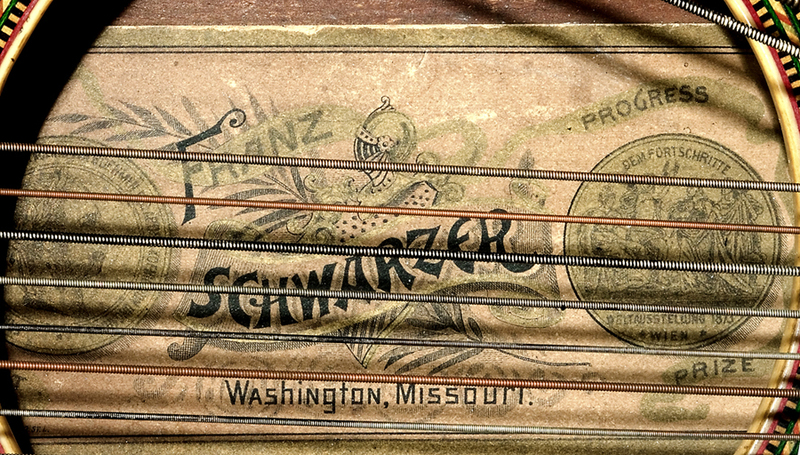 Alpine zither (Arion Perfecta zither) by Franz Schwarzer, Washington, Missouri, ca. 1891-1920. Schwarzer’s Piano Bottom Perfecta Arion Harp. 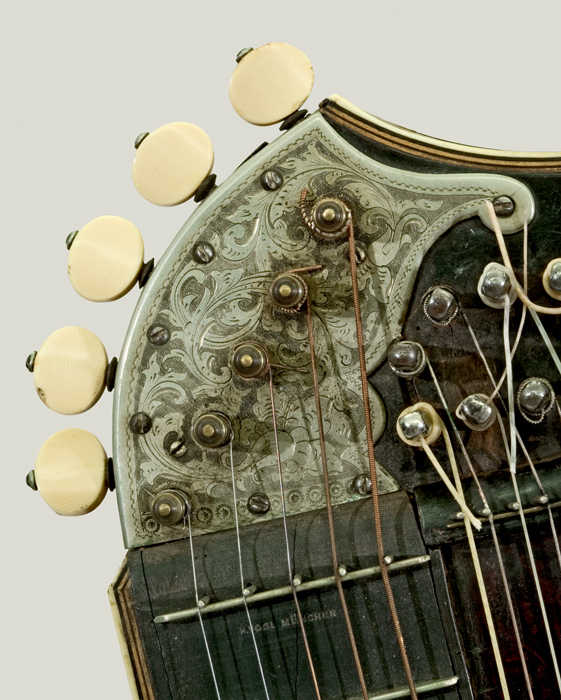 Serial number missing due to fingerboard replacement. 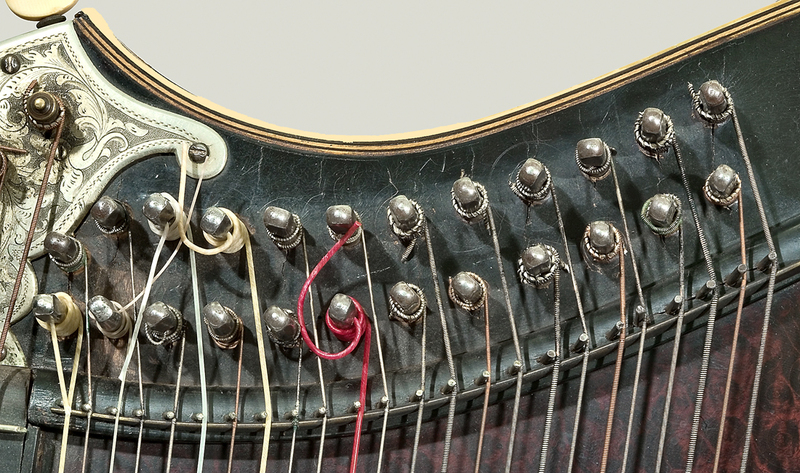 42 strings (5 melody, 24 bass strings, and 13 sub-bass strings). Rosewood veneer, ivory edging and pegs. Body: 480 mm long, 370 mm wide; fretboard: 60 mm wide. 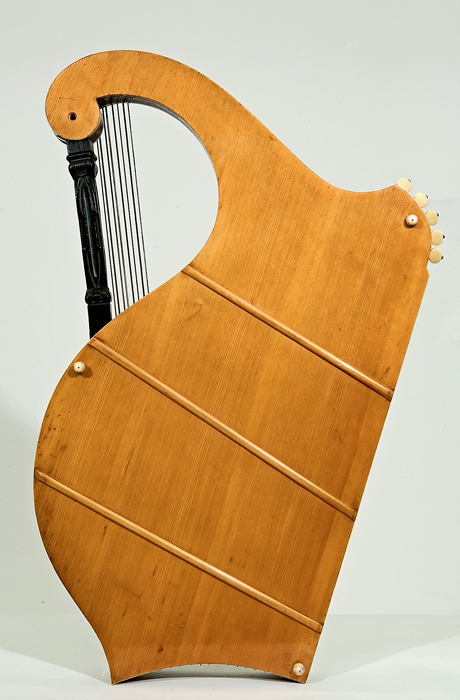 One of only 98 Perfecta Arion Harps sold by the Schwarzer company. Ex coll. : John Christian Scherer III, Director, Twin Cities Zither Club, Minneapolis/St. Paul, Minnesota. Paul and Jean Christian Collection, 2006. Schwarzer introduced his piano bottom zithers in 1891. 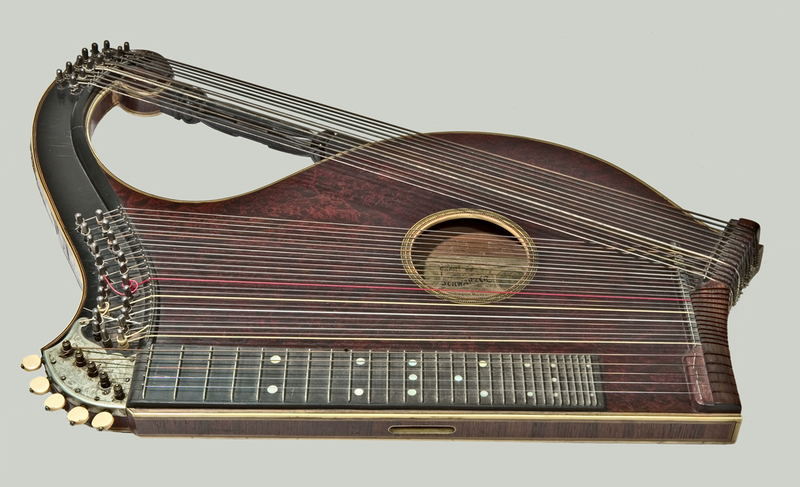 This Schwarzer zither was the prized possession of Minneapolis zither soloist, John Christian ("JC") Scherer III (b. Minneapolis, 9 June 1876-d. Minneapolis, 14 August 1956). 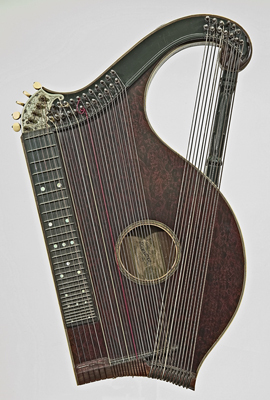 Scherer, who began studying the zither in his youth, became a well-known zither player whose performances included appearances with the Minneapolis Symphony Orchestra under the direction of both Henri Verbrugghen (1923-1931) and Antal Dorati (1949-1960). 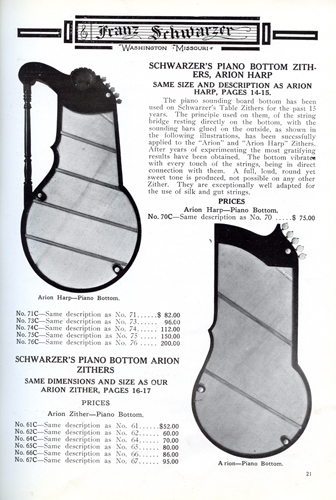 According to the Minneapolis Morning Tribune (January 20, 1953, p. 16), "John C. Scherer, president of the Scherer Printing Co., will leave the workaday world behind today to play his zither with the Minneapolis symphony orchestra at the first 1953 Young People's concert. 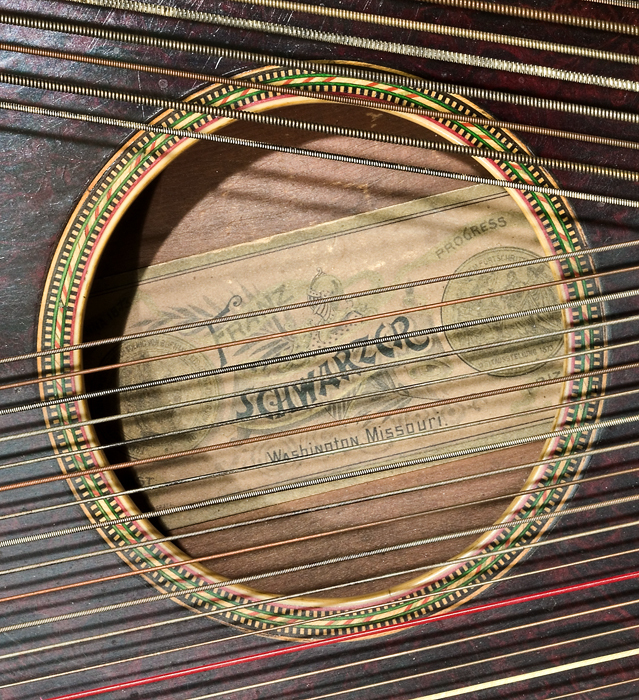 Scherer, who has played the zither as a hobby since he was a youngster, will play the zither part in the Johann Strauss waltz, 'Tales from the Vienna Woods'." 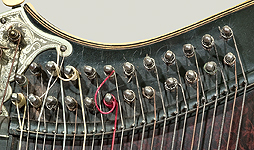 Dorati's subsequent recording, Four Great Waltzes by Johann Strauss (Mercury Classics Olympian Series, MG50019), features Scherer's performance on his Arion Perfecta zither. 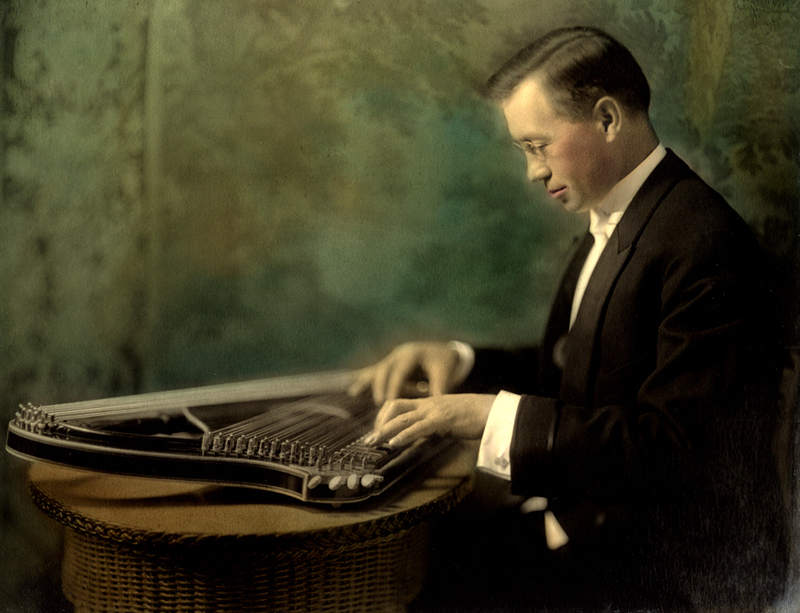 At the time when this hand-colored publicity photograph was taken, Scherer was the Director of the Twin City Zither Club (organized in 1920) and a member of The United Zither Players of America. Programs and related publicity materials preserved in the Paul and Jean Christian Collection Archive at the NMM reveal that Scherer played this same zither in both solo and ensemble performances at the Fifth and Sixth Congresses of the United Zither Players Association of America, held in Buffalo, NY (1920), and Minneapolis/St. Paul (1922). • NMM 12963. 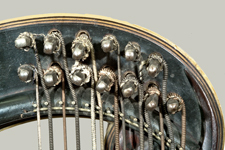 Alpine zither (Salzburger form) attributed to Johann Haslwanter, Munich, ca. 1880-1890. Presented to Scherer by his zither teacher, J. Schwemberger, for whom the zither was originally made. Paul and Jean Christian Collection, 2006. • NMM 12965. 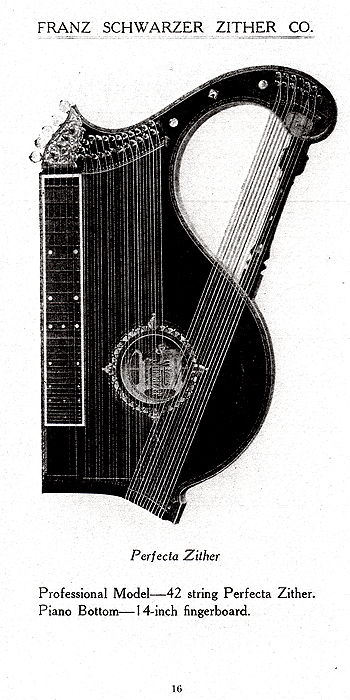 Alpine zither (Salzburger form) by Johann Haslwanter, Munich, ca. 1863-1884. Paul and Jean Christian Collection, 2006.